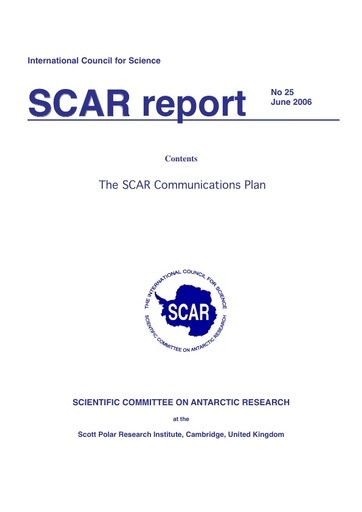 One of SCAR’s five primary goals is “to communicate scientific information about the Antarctic region to the public.” Accordingly, the SCAR Delegates meeting in Bremerhaven in October 2004 approved development of a Communication Plan as a key management tool for achieving SCAR’s long-term goals. This strategic decision accords with the recognition by SCAR’s parent body, ICSU, in its Strategic Plan 2006-2012, that: “Scientists and their representative organisations have to accept increasing responsibility and develop new mechanisms to share their understanding with many different stakeholders in society. Renewed efforts have to be made to ensure that [the voice of the science community] is heard where it is most needed. benefit from SCAR activities and programmes. The Plan identifies a suite of target communities or audiences, each of which will require the SCAR message tailored in a different way. Because many of these communities are at the national level, the task of communicating SCAR’s message has to be shared between the SCAR Secretariat acting centrally and at the international level, and the National SCAR Committees acting nationally and at the local level. Key audiences for the SCAR message include: the scientific research community; the pre- university school population; the general public, including the media; policy makers; decision-makers and funders; and SCAR’s management. The Plan describes a variety of communications tools that may be adapted for the purpose at hand, and a mechanism for evaluating the performance of communication efforts. Where appropriate, SCAR’s communications at national and/or international levels should be carried out jointly with the Council of Managers of National Antarctic Programmes (COMNAP). The Plan was approved by the Executive Committee at its meeting in Sofia, Bulgaria, July 11-13, 2005, following consultation with national committees and delegates by e-mail.